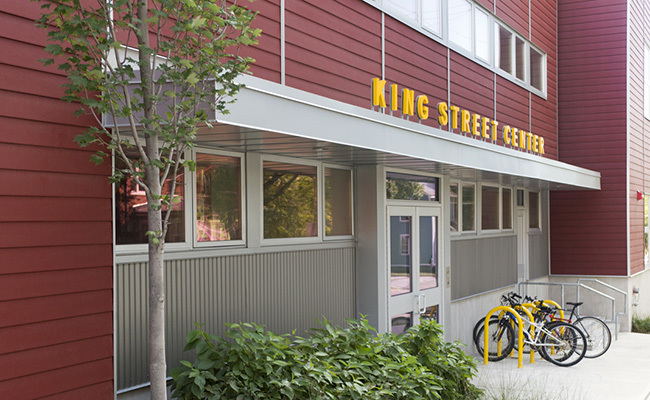 While King Street Center is a busy facility, we welcome inquiries about space rental for your non-profit group or company use. Our gymnasium, conference room, and “Playhouse” multi-use space may be available for your meetings or practice. Unfortunately we cannot accommodate large parties/celebrations. All rental inquires should be directed to Facilities Director, Frank Zavadil, at frank@kingstreetcenter.org or 802-862-6736 x104. Weekday time frame is 9 a.m. – 5 p.m., Monday – Friday. Front desk reception included. Evening time frame is 5 p.m. – 9 p.m., Monday – Friday. No front desk reception available. Weekend availability on Saturday and Sunday is flexible. Evening and weekend use will require key pick-up and drop-off during weekday business hours. No front desk reception available. Conference room furniture can be set up as single, large table or divided into sections. Chairs and rectangular tables available for Gymnasium & Playhouse at no charge if renter is setting up/breaking down. If set-up is required by King Street Center staff, additional service fee will be determined in advance. Wifi included at no charge throughout the building. Projector/screen available for $15 additional service fee. Kitchen available for food preparation, but not food storage. Additional service fee will be determined in advance. Download sample rental agreement here.